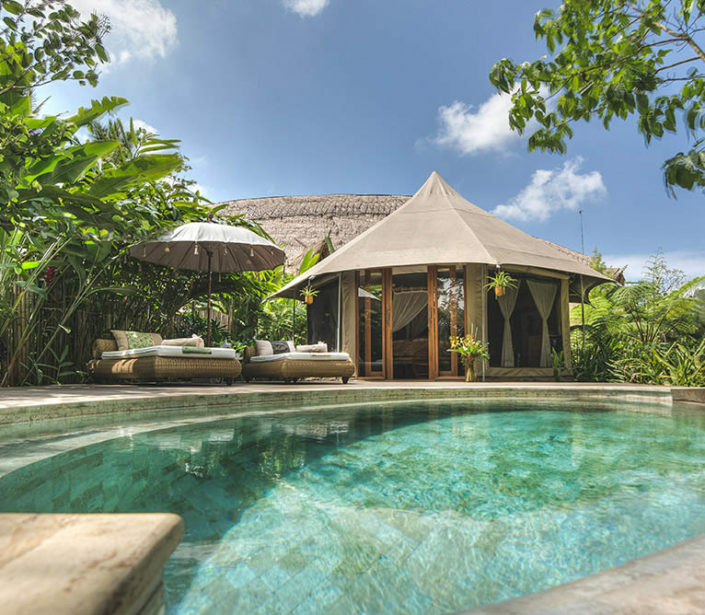 One of the most exclusive destinations in the green rice fields of Ubud, a unique experience not to be missed. Island called “the island of the gods” considered to be among the most famous destinations in the world. 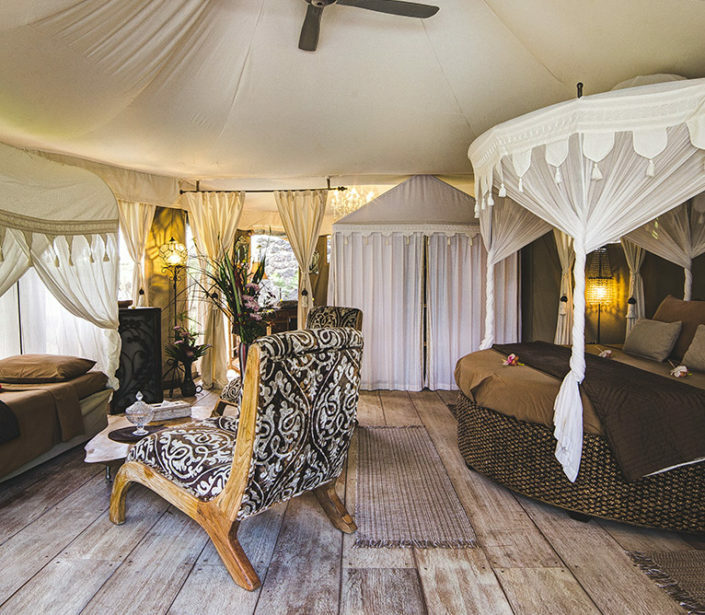 In 2013 the first glamour camp of Bali was born, and it’s the Sandat Glamping Tents which is located just 3km from Ubud the cultural centre of the island, and the most sought after destination in terms of tourism. Immersed in a corner of paradise, where the green rice fields create unique landscapes made of sinuous terraces. 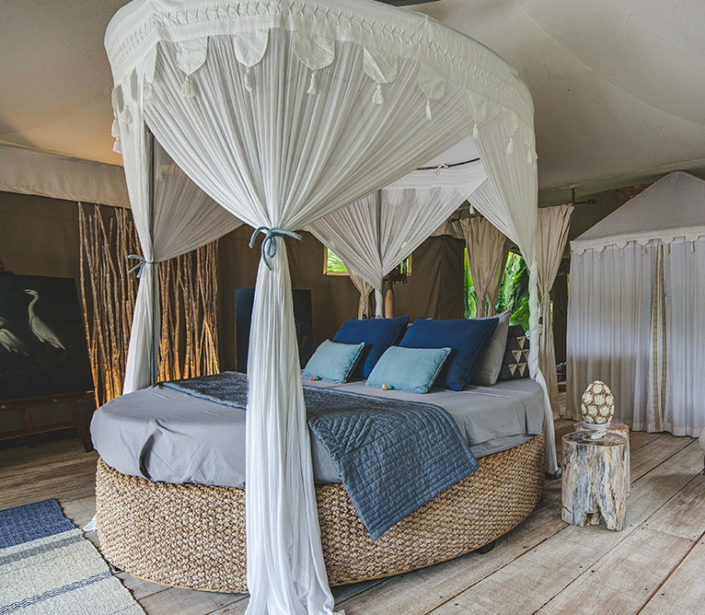 The Sandat Glamping offers unusual and refined environments and influences in a matter of taste mainly Italian, combining details from East and West, creating environments with refined and charming atmospheric details. 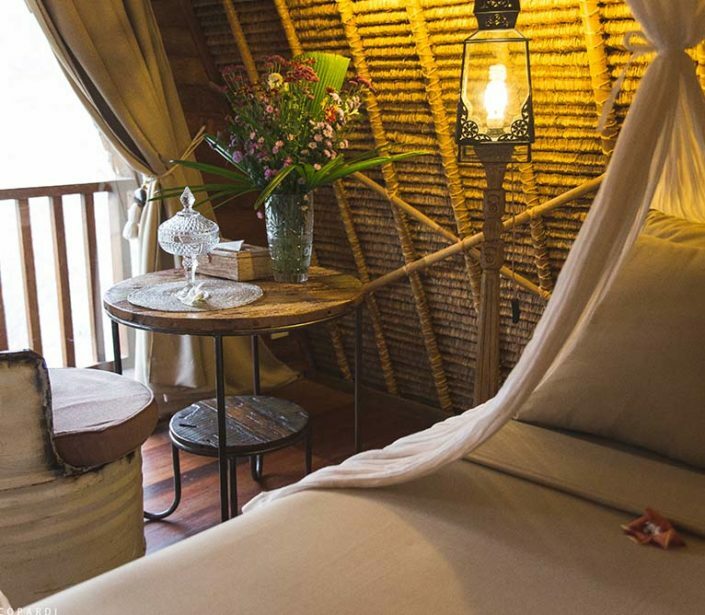 Staying at Sandat means to try the experience of being in harmony with the explosive natural surroundings but not sacrificing the pleasant luxury of sleeping on a four-poster bed overlooking the forest or enjoy a glass of wine surrounded by a private pool. 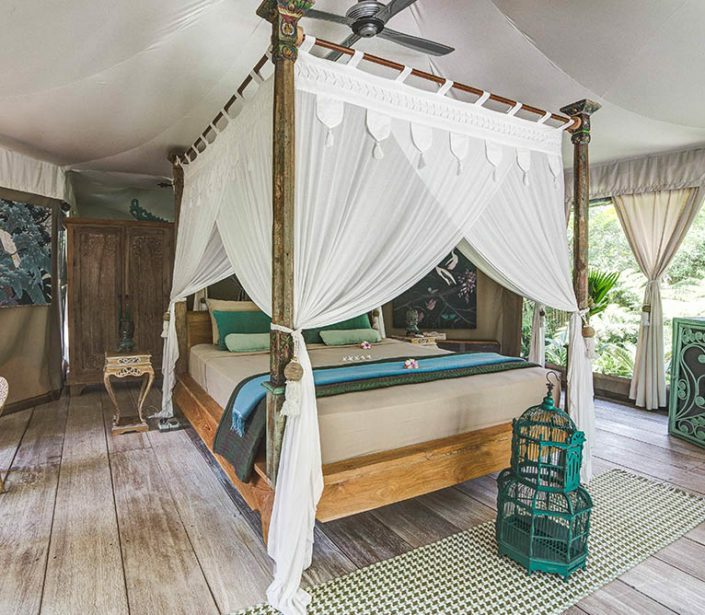 5 magnificent luxury Tents in “safari” style of the size of 40 square metres each with a private pool overlooking the forest surrounded by tropical gardens with a spectacular indoor bathroom. 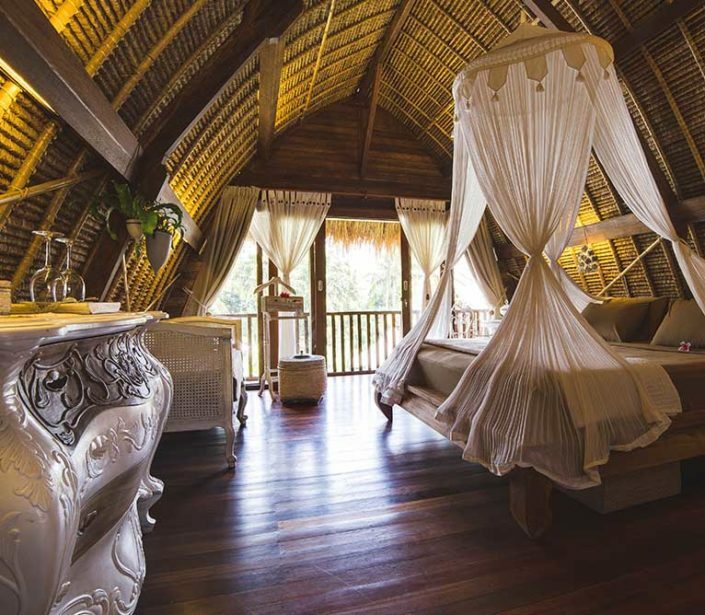 3 luxurious Lumbung that are typical barns with a characteristic thatched roof that touches almost the ground converted into evocative and romantic rooms on two floors. Guests can then have a surprising central structure high up to 10m, an example of a more “modern bio-architecture” characterised by a winding staircase that recalls the shape of the surrounding rice terraces and there by connecting the different zones creating a unique environment of over 240 square meters. Dominated by an impressive wall that houses a collection of 101 mirrors. The white colour of the flooring creates a relaxing and fresh atmosphere. To relax back from your excursions and pleasant social occasions, the elegant lounge area offers comfortable sofas where you can read a book, surf the internet, listen to some music or play chess, cards and backgammon and why not chat with friends and guests enjoying a good traditional ginger tea. A scenic setting, reminiscent of a cathedral bamboo houses the Sandat restaurant with its sumptuous table more than 8 metres long where guests can dine surrounded by sounds of nature. Do you want to celebrate a special occasion , or just looking forward to making an unforgettable glamping experience in Bali? There is no more impressive way than trying out our dinner for two by candlelight on the edge of your private pool overlooking the forest. What could be better than starting the day with a hearty breakfast? 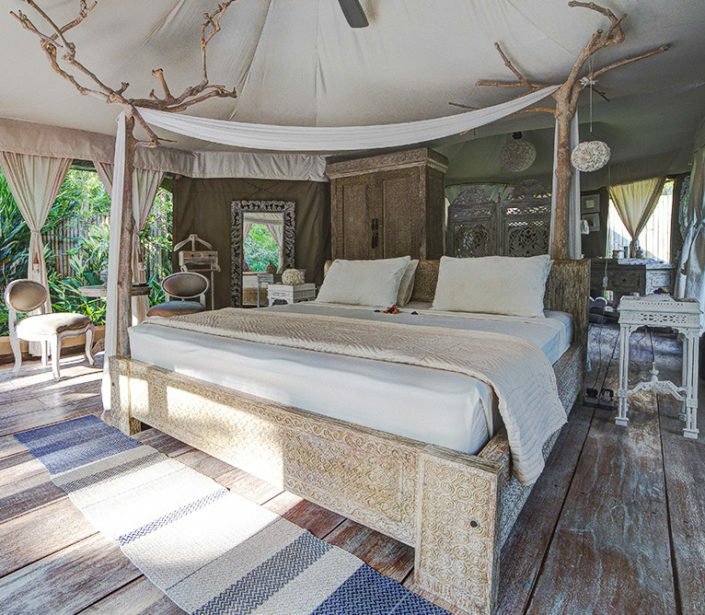 The awakening in sandat glamping tents is a gentle awakening accompanied by the sounds of the forest and the traditional Balinese music. The scent of coffee and warm bread will wrap you in the charming living area where you can enjoy a wide range of high end products both sweet and savoury. Take care of your body and give yourself some time to relax, farmstead offering massages and beauty treatments. These proposed welfare services are a source of unique benefits that can ease the tensions of the body and relax the spirit. 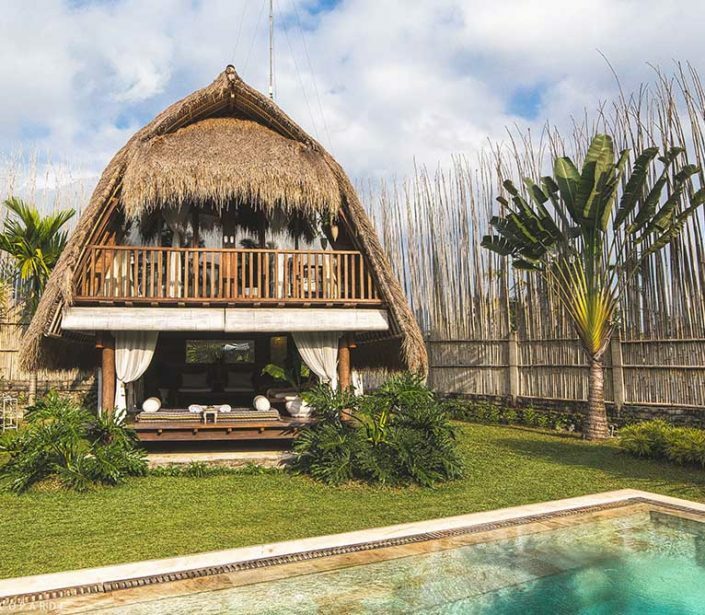 In a privileged position, overlooking the rice terraces, is the impressive and wide circular structure in Bamboo where you can enjoy relaxing yoga classes in rich and stimulating environment for the nourishment of the body, mind , and soul with a wonderful forest view and the green rice fields surrounding the glamping.